What makes aluminum siding so desirable is its ease of maintenance and pristine look. With minimal effort, your sided home can look like new. If dirt and algae do appear, you (or your home's previous owner) may not have bothered with that minimal effort. Don't worry. It is not too late to clean and restore your home to its shiny newness. Wash the whole house with a mix of common laundry detergent and water through a presser washer once a year. For those tough spots, use a gentle brush and then spray away. Aluminum is not vinyl, however, so whether you are scrubbing or spraying, go gentle or your siding with dent. Maintenance is the first step to preventing the build up of moss, algae and mold. Create a mix of bleach and water (1 tsp. to 1 quart) and use it in the same power washer as Step 1. The bleach mixture alone should remove the algae, mold and moss that is sometimes mistaken for algae. Use the above mixture in the same power washer used in Step 1. Wash the house. 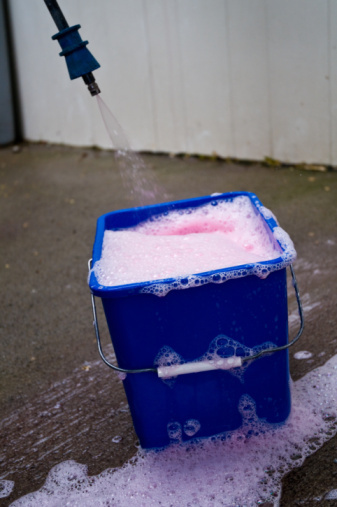 Rinse the house with clean water to remove the bleach residue and prevent streaking. Consider adding Jomax to your bleach mixer if the algae recurs too quickly. The product, which enhances the bleach's cleansing power, can be found at most hardware stores. 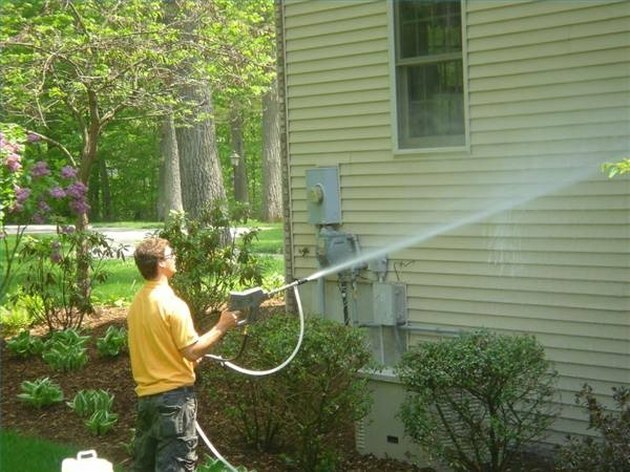 Apply to the house with the power washer and rinse clean.